And as you’re providing personalized support and guidance, you absolutely CAN and SHOULD attach a premium price tag to your services. Higher prices for your services means you need less clients to create the income you really desire. Less clients means more me for you to spend doing the things you love. More time for your family and friends. More time for vacations and spa weekends with the girls. Simply put, more time for YOU! After all, these are the reasons why you started your coaching business in the first place. But it hasn’t quite panned out like that has it? Instead of having more time freedom, you’re spending more time than ever trying to market your coaching and get clients. There are so many different channels to consider. Should you be doing paid traffic? Social media? Public relations? Search Engine Optimization? Blogging? Video? Youtube? and leaves you feeling overwhelmed! The next problem is the few clients that are interested in your services aren’t willing to pay you what you’re worth. So while you expected a calendar full of clients, paying you top dollar for your services... it’s actually the opposite. Your calendar is empty and the clients that you do have, are paying you only a fraction of what you wanted. It’s frustrating and makes you question why you started this coaching business in the first place. I know how you feel because that’s exactly where I was when I started. I felt the same way. Overwhelmed and frustrated. That is until I found a better way. A way to have an unending stream of qualified clients, willing to pay what I’m worth AND have the free time I desire to do what I wanted. And today, I’m sharing the exact same plan that I used, and that I’ve successfully used with my clients, to get them the outstanding results that they REALLY deserve! Isi Aladejobi, who made $25K in 6 weeks, and Chichi Eruchalu, who had her highest grossing month just 4 weeks after working with me which was just under $10,000. Leigh Shulman who is a book coach and retreat leader who made $21,000 in just 3 weeks, and she didn’t even make 20k in 2015. Marya Jan Facebook ad strategist who signed up 3 clients in one week and went on to have her rst 40k month. Elyse Tager, who was a brand new Facebook advertising strategist, enrolled her rst client at $6000 within ONE week and another client in the second week and made $9500. Sacola Lehr didn’t book any discovery calls in 2016 and she enrolled her first premium client and made $3000 in her second week of working with me, in my signature programme Sales in 6 Mastery. 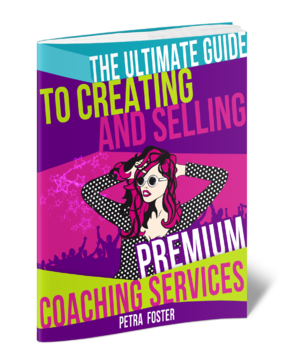 Ashley Armstrong was overwhelmed, she didn't have a structure on how to conduct a sales conversation and then she enrolled 2 clients and made $73,000 working with Petra"
This is the step-by-step strategy that my clients use to attract premium clients with joy, con dence and ease... Without a celeb-style following, without a huge email list, and without spending hours each and every day desperately chasing prospects all over social media! If you implement what you discover in this guide, you CAN completely transform your business and skyrocket your earnings... Even if you’re currently stuck charging low hourly rates, and you’ve never even really considered the fact that YOU could charge premium rates. I’m here to show you that it’s VERY possible, and it all starts right now! Every successful, high ticket coaching service needs to have a solid, quality foundation. And the basis of that foundation is YOU! The first step is to have a clear plan on the type of coaching that you will deliver. 1: WHAT AM I SELLING? Think very carefully about what it is exactly that you’re ACTUALLY selling. Drill down into the benefits of your service and the transformation that will take place in your client’s life. For example, if you’re a nutrition coach? You’re absolutely NOT just selling a few hours of your time. No, YOU’RE SELLING A HEALTHIER LIFE. You’re selling your client on being able to keep doing the things they love doing because they don’t get sick anymore. You’re selling them on being able to run around with their kids or grandkids because they’ve lost weight that was slowing them down. THE KEY HERE is to think bene ts not features. Most people NEVER go beyond the ‘surface level’ of what they offer... And that’s precisely why they struggle to sell their services to their prospects. People aren’t really bothered about having a chunk of your time, or access to you via email... They want change. They want results. It’s your job to make sure that your offer very clearly communicates the REAL value of working with you. 2: HOW MUCH DOES IT COST? The cost of your coaching program is a very sensitive subject. You want to charge a fair price for your time and expertise but your clients still need to feel like they are getting more value than what they are paying for. The important thing for your pricing is what is called value based pricing. What is your service worth to your client? If you are a business coach and with your plan, your client can earn an additional $100,000 per year... wouldn’t that client be happy to pay your $5,000, $10,000 or even $25,000 for your services? So following on from the first step above, now you have to quantify what those benefits are worth to your clients. If you’re currently charging by the hour, then at this stage, it’s likely that you’ll see how you’re MASSIVELY undervaluing your services. For a marriage coach that can save someone’s marriage, saving them the heartache and stress of getting a divorce... isn’t that priceless? Sure, your clients might get a few hours of your time. But they’re also getting a service that changes their lives for the better, gives them more peace of mind, and saves them from devastating heartbreak. Many business owners freak out about pricing. If you want to be successful though, you NEED to get this nailed! You need to know your value, and be able to e ectively communicate it to your prospects. 3: WILL I OFFER A PAYMENT PLAN? For high ticket coaching, a payment plan is always a good option. You can over monthly payments or 50% upfront, depending on the duration of the coaching package. Another option would be to o er a discount to those clients that are willing to pay your fee in full upfront. This makes it super easy for your prospects to say YES to the life- changing results that you’re about to create for them! 4: HOW WILL I STRUCTURE MY PROGRAM? What is your program going to look like? How long will the coaching be? 3, 6, 12 months? Will you have a structured plan that each client goes through or a more dynamic, adaptable program that caters to individual situations? Will you use recorded videos supplemented with weekly group calls? Or do live one on one training via Skype? You can even offer unlimited support via email or IM and have a monthly call to catch up on progress. The options are limitless so choose something that suits your personality and your time constraints. 5: WHAT IS THE NAME OF MY OFFER? Think of a name that communicates clearly what you’re offering. Listen, I know that it is. SO many of my clients come to me feeling overwhelmed, stressed out, and unsure about their future. Often, all they really know for sure is that they care about what they do, and that they’re sick of struggling. As you can see, the essence of the programme is VERY clearly communicated in the name! 6: WHAT IS YOUR OFFER ABOUT? With the previous questions answered, you’re ready to define your offer. This is a short statement about what you do and what you offer. Combine everything we talked about into 2-3 sentences that talks clearly about who you are, and what you over. So we’ve got the foundation of your coaching offer in place. Next, you need to be very clear on who you target market is. Too many coaches I’ve met and spoken to do not have a very narrow, speci c niche... And this hurts them. By specializing in one niche you become the authority and leader in the market. Which allows you to command premium rates. So to get clear on your target, answer the following questions. 1:Who are your ideal clients? After your plan this is your most important step. Drill down on not only who you want to work with but, also who you can help the most. Build an avatar of what your ideal client looks like. Think of things like, is it a man or woman, are they married, do they have children, where do they live, how much money are they making, what do they do for fun, what are their goals and dreams. You need to get into the mind of your ideal client. The questions below will help you do that more. An important factor of course is can your target market a ord the premium prices you want to charge? If the answer is no, then you may have to go back to your o er and who you are targeting and tweak things. 2:What are 3-5 BIG challenges your ideal clients face? The next step is to understand the challenges that are facing your ideal clients. They are problem su ering from a lot of problems, so write out some scenarios of what that looks like for them, what is it that they are struggling with and think of some real life examples. For example, imagine you’re looking through a window at your ideal client as they face the challenges they are struggling with. It’s important here for you to do this exercise because it puts you in the position of your clients. Be as specific and descriptive as you can be. This helps you understand what they are going through, which helps you connect with them... making them more likely to hire you because you empathize with them. Most people do NOT drill down on their niche, and this is exactly why they struggle. You absolutely can’t help everyone, and if you try to, you’ll stay stuck exactly where you are. This is vitally important! 3: Which one main problem does your offer solve? From your list above you can see your client is suffering from a lot of problems... but what is the one, single problem that you can solve for them? Which of those challenges that you noted is it that keeps them up at night when they go to bed? Tap into their pain points and see how your o er can align with those pains and be the solution they have been looking for. So we understand now the struggles and pains of our market. But they don’t just want to work with someone that understands them... they want to work with someone that can FIX their problems. They want a solution, they want RESULTS. 1 What are the benefits of your program? This is similar to the bene ts we discussed in the foundation section, so make a list of all the benefits, drilling deep into each of them to get to the root benefit. The more bene ts the better. Think about what your client’s life will be like after they successfully complete your coaching program. What is it they will be able to do, achieve or experience thanks to your offering? Remember to talk about benefits, not features. Your may offer a weekly 1 hour call but that is a feature of your program. The benefit of the 1 hour call is that your client gets 1 dedicated hour of one on one time with you to work through their stumbling blocks. 10 WHAT IS THE MAIN RESULT OR BRAND PROMISE OF YOUR PROGRAM? Just as you narrowed down your client’s problems to one, single problem... you need to narrow down the benefits of your coach to one primary benefit. Take a look at your list of benefits and compare it to the biggest challenge your clients face. Which benefit best ts the number one problem they face? If you help people that struggle with diabetes and their biggest problem is they are tired of having to stick themselves with needles for insulin... There are many benefits to your coaching e.g. they can lose weight with your diet plan, lower their blood sugar levels and get more active. But if the main promise you can make to them is that they will no longer need insulin... your primary bene t speaks directly to their number one problem. If someone asked you, “What will I get out this?” or “What will I walk away with?” You’ve got to have ONE ANSWER, not a multitude of things. Once you have done this you will be on your way to delivering a program that can actually solve the problems your clients have because you understand exactly what they struggle with. to joining your coaching program. The time to understand those objections and how to overcome them is NOT when you’re a call with your client trying to close them. 1: What are the main objections to the offer? Walk through in your head the objections people will have to your offer. Price is usually the main concern for people. But if you followed the steps above, where we quanti ed what our coaching is worth to the client and then making them an o er that is too good to pass up in comparison to that value then this usually does not come up. Make no mistake... People DO have the cash to invest in what matters to them, when they can clearly see the value. Think about other objections they may have, like they don’t have time to commit to a coaching programme or they need to talk it over with their spouse. List as many objections as you can. Remember, you don’t want to be stumped during a sales call with an objection you didn’t think of... so spend the time now and it will pay o later. 2:How will you counter these objections? The next step is of course to develop responses and plans for overcoming the objections. Each objection you listed above needs to have a response that will assure your client they are making the right move in hiring you and move them closer to booking your client. Again, the time spent here rehearsing and practicing your responses to objections will pay in the end. Handling objections is the crux of closing high ticket clients, your entire coaching success depends on being able to overcome your prospect’s objections. You’ve got a great offer that provides genuine value to your client. Value that you have quantified and your client agrees he’s getting much more value than he’s paying. But now it’s time to close the sale. “I would be stupid if I didn’t take it” offer. Think about what you can add to the plate to push them over the line and make your offer even more compelling. Maybe you can offer them a free copy of your book for signing up, or include an extra month of coaching. Anything that you can add to sweeten the pot for your clients works. The next tactic for closing the sale is adding in an element of scarcity. Using limitations such as a time limit for registration, limiting the number of people you sign up or even letting them know that the price of the program will increase soon. This all adds a sense of urgency and scarcity, moving them closer to the sale. Don’t say you only have 5 spots available for coaching and then take on 10 students. People will know and your integrity will take a hit. Be honest about why you can only take on 5 students right now. Scarcity and urgency are key to closing the sale so be sure you think about how you can add it to your offer. There you have it, the very critical elements to a successful premium coaching service. Of course, having someone hold your hand and guide you through the process makes it that much easier and increases your chances of success. So why not book a call with me. Sales in 6 Mastery isn’t the type of programme where you are left alone and just given theory. Sales in 6 Mastery my signature group coaching programme, and it’s your passport to $10k+ paydays in record time. If you’re sick of earning an average income, you’re struggling to book discovery calls, and when you DO, they often turn into a total disaster? Then you need to book a call with me! I earn multi 6- figures a year from doing the work that I love, and my clients do the same. You don’t need a celebrity-style status, thousands of email subscribers, or even a huge social media following to position yourself as the go-to expert who dream clients just can’t wait to work with. What you DO need is to finally master the art and science of selling, and ensure that you’re applying the strategies that will guarantee your results. This is exactly what I’m going to show you in this intimate 6-week programme. Within 6 weeks, I created $13,000 with no list, no contacts, and not a great deal more than my passion for sales and my dedication to help other people to break free from the constraints of low hourly rates, and transition to a premium business model. Within a year, I’d created $104,000, and I’d helped dozens of women to sell premium services and hit $10k+ months. My mission is to show you that enrolling premium clients is not just possible for you... It is VERY achievable, regardless of where you are right now, how low your rates are, and how long you’ve been earning less than you desire. And you can do it in 42 days or less. Want To Find Out How We Can Personally Help Youbuild your Personal Brand, create your $3000+ premium packages, and enroll high end clients with ease? If you like it, and we like each other... it’s a match made in heaven.